What Does it Mean to be an #MCPSGrad? 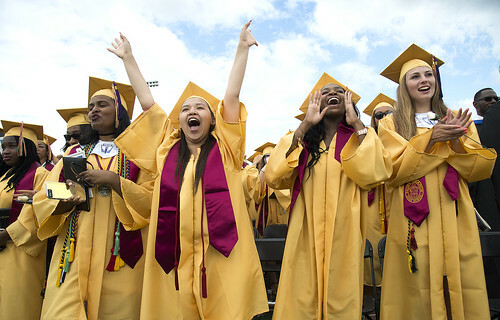 More than 10,500 students are graduating from Montgomery County Public Schools in 2018. Listen to some of our graduates as they reflect on their time with MCPS and their plans for the future . ...With the growing technology, I’m thinking about studying computer science, there are so many opportunities out there, specifically in cybersecurity. MCPS really pushes you to go beyond what you can do. Teachers are glad to help you with stuff so that you understand everything. Once I graduate from college, I will pursue a career in education or computer sciences. La graduación es darle un orgullo a mis padres. He tenido la oportunidad de conocer muchas culturas aquí en Damascus. When I went to high school, I was able to join clubs, do sports and I also compose music. 가을부터 저는 메릴랜드 대학교에서 교육학을 전공할 거예요. je peux dire à la fin, que oui, ça a commencé à MCPS.